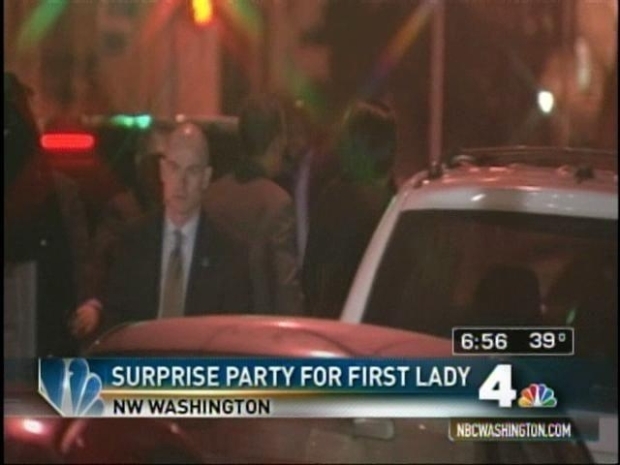 First Lady Michelle Obama turns 46 today, but she got a big surprise Saturday night. President Barack Obama brought Mrs. O out for what seemed to be just another date night -- until the cheers and applause erupted as they walked into Restaurant Nora, the tony Washington restaurant known for its commitment to organically grown food. Executive chef Benjamin Lambert told The Washington Post he had plenty of time to prepare for the first couple's first visit to the posh eatery. And he claims he wasn't nervous, not for a minute, even as two Secret Service agents stood guard in the kitchen while he prepared their meal: a special lamb dish for her, and pan-seared Maine lobster and saffron risotto for him. When President Obama brought First Lady Michelle Obama out Saturday night, she thought it was just another date night -- until cheers erupted from the restaurant. Surprising the birthday girl at the Dupont Circle restaurant were her mother Marian Robinson and friends, including Attorney General Eric Holder, White HouseAdviser Valerie Jarrett and Jocelyn Frye, who is a domestic policy adviser to both the president and first lady. The President probably would've done something similar on Sunday, but he is expected to be in Massachusetts campaigning for Martha Coakley, who is in a tough fight with Scott Brown to replace the late Sen. Edward Kennedy and retain the Democratic party's 60-vote majority in the U.S. Senate. Last year, Mrs. O spent part of her birthday on a train from Philadelphia to Washington, as her husband made his way to the Capitol to be inaugurated. Restaurant Nora claims to be a pioneering organic restaurant, with 95 percent of its food produced by organic growers since 1999. President Bill Clinton and his wife, Hillary, also used to dine there.